So what’s the difference? Why are some people so sensitive to peanuts they can’t even be near them, and you’re being told you have a ‘gluten allergy,’ but don’t feel much different after you eat it? A true food allergy involves the immune system and your body creating an immediate response (IgE antibodies); the reaction is immediate and often severe, often including respiratory problems. A sensitivity also involves the immune system, but produces a milder, non-typical and often delayed physical response (IgG antibodies). An intolerance is a gastro-intestinal or metabolic response – when you’re lacking enzymes to digest particular foods. The most infamous example is lactose intolerance. People who have immediate physical reactions to foods are experiencing an immune response to what their body is interpreting as a foreign invader. These people have a food allergy. The particular substance that causes this reaction is called an allergen. Most often allergens are a protein within the offending food. Exposure to an allergen will stimulate your body to produce a hypersensitive response to an innocuous substance – one that does not cause a reaction in most people. 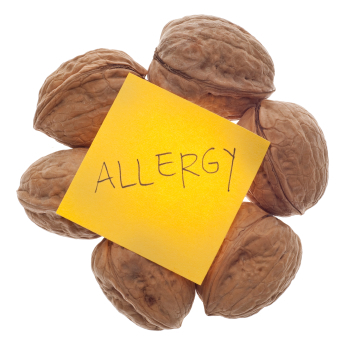 Allergens are recognized as ‘not-self’ by the body, so the body attacks. An IgE immune reaction initiates an immediate production of antibodies and a release of chemicals, including histamines, which can result in a range of symptoms, from mild to severe. These symptoms may include skin irritation, rashes, hives, stuffy/runny nose, swelling, wheezing, nausea and/or vomiting, trouble breathing, fainting, and any symptoms of anaphylaxis. IgE immune reactions resulting from food allergies can be fatal. After the offending food is ingested, the IgE levels rise immediately. These levels will usually lower relatively quickly, but in some cases can maintain elevated levels for 5-7 days. Complete avoidance of the offending food/allergen is absolutely necessary. There are 8 foods, listed at the top right of this page, that cause 90% of the world’s food allergies, but you can be allergic to anything. Please note that wheat is included in the gluten category, but there is a distinct difference between having a gluten allergy and a wheat allergy. Click on each food to find further information. The Food Allergy & Anaphylaxis Network has created an extremely useful guide for avoiding the most common allergens. Food sensitivities also initiate an immune reaction, but instead provoke an IgG immune reaction. These antibody levels rise much more slowly than true food allergy immune reactions, so the symptoms are quite different, and they are more difficult to diagnose. The reaction is a delayed response, taking anywhere from hours to days to manifest, and may linger in your body for as long as 3 weeks. What can complicate matters is that you may not experience a sensitivity the first, second or even the twentieth time you ingest something. In fact, it’s common to develop a sensitivity to something you eat every day, and often it’s to the very items you crave (bread, chocolate, etc). What has happened is that you have not yet reached your ‘symptomatic threshold,’ but your IgG antibody levels are slowly accumulating every time you expose yourself to the offending food item, until eventually you develop symptoms. It’s also possible to have sensitivities to chemical compounds that are present in a number of foods, such as salicylates, which can make uncovering the cause all the more difficult. IgG responses triggered by food sensitivities are less severe than IgE responses, but they can cause chronic problems including migraines, digestive issues (including constipation & diarrhea), weight gain and loss, joint pain, skin outbreaks, fatigue, and other symptoms usually associated with poor gut health. Understand that although food sensitivities are not life threatening, they can contribute to health problems which will compromise your overall health, such as leaky gut and a compromised gastrointestinal tract. Because food allergies (IgE responses) cause much more severe and immediate responses, they are in fact easier to diagnose and thus to treat. Food sensitivities (IgG responses) may take days to show up, are not easy to test for, and therefore much harder to diagnose, sometimes leaving people in a guessing game as to what is causing their health issues. The gold standard test for food sensitivities is an elimination diet. An elimination diet can be difficult and frustrating, but when done with the guidance of a nutritionist or health practitioner, can be extremely effective and beneficial to your long term health. The Food Allergy & Anaphylaxis Network has created an extremely useful guide for avoiding the most common sensitivities. You may be familiar with the condition of ‘lactose-intolerance,’ which simply means you lack the enzyme called lactase, which is necessary to digest the sugar found in dairy: lactose. You can also lack enzymes to digest fructose, gluten and many more substances found in common foods. Sometimes the terms food intolerance and food sensitivity get used interchangeably, which can add confusion. The difference is that food intolerances do not invoke a delayed immune response like food sensitivities. Intolerances are a metabolic and gastrointestinal reaction. Once you have determined the offending foods, you must avoid them entirely or consume on a rotating basis after doing an elimination diet, slowly adding back into your diet if you can tolerate it. Some people find relief in taking digestive enzymes when eating foods they are intolerant to. It’s much easier to accomplish this task with the assistance of a health professional, as it can be difficult to determine the poorly tolerated substance as the reactions can be delayed, dose-dependent, and a particular compound within a food that you are unaware of. Important: results of all food allergy and sensitivity testing must be further investigated by you and your health practitioner, as the results are not always indicative of your body’s reaction. Negative results tend to be very reliable in ruling out an IgE allergy reaction to a particular food, but a positive result does not necessarily mean you will have a physical reaction to that food. For instance, a food allergy IgE blood test may indicate that you have an allergic response to 10 foods, but you feel okay when you consume some of them. There are certain foods that may show as positive on your results that you once had a reaction to, but your body will no longer produce symptoms when you consume it. You may be able to handle them on an infrequent or rotating basis. Then there are foods that will show up as positive, and you will produce an immediate (and potentially serious) reaction. These tests provide a good starting point in figuring out what you can and cannot eat. Utilizing the results of a food allergy test, combined with an elimination or rotation diet (which should not include any food you suspect might produce an immediate IgE response) is the most practical and definitive way to determine what you can and cannot eat. There are different tests to determine true food allergies that will test your antibodies and see if you are having an actual immune response to substances. The two most often utilized are a skin prick test and a blood test. 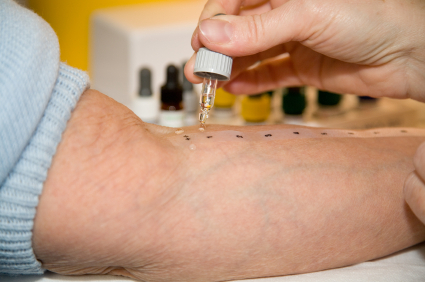 Skin prick testThe skin prick test is usually affordable and easy to do when visiting your health practitioner. The practitioner presents each potential allergen one by one. The practitioner will prick your skin (relatively painless) with a probe and wait to see if there is a reaction, which is a mosquito like bump. “Serum food-specific test” or “RAST” (Radioallergosorbent test) is a blood test administered by your doctor or health professional and measures the level of IgE in your serum. This will test for food allergies only. ELISA (Enzyme Linked Immuno Sorbent Assay) is a blood test administered by your doctor or healthcare professional that measures the levels of IgE (immediate reactions – food allergies) as well as IgG (delayed reactions – food sensitivities) in your serum. This will be more useful for food sensitivities, though some professionals do not believe the IgG response is reliable. ALCAT (Antigen Leukocyte Cellular Antibody Testing) is a serum test that assesses white blood cells before and after exposure to an antigen/allergen. This test detects sensitivities, not IgE allergies. The change of size and number in your white blood cells will determine if you are reactive to that substance. There is not much evidence that it can detect gluten sensitivities. MRT (Mediator Release Testing – also referred to as LEAP) is a serum test very similar to the ALCAT, but claims to be more specific, with reviews of the test exhibiting higher accuracy rates of sensitivity detection. There is not much evidence that it can detect gluten sensitivities. Both saliva and stool tests can detect gliadin antibodies, if you believe you have a gluten sensitivity.